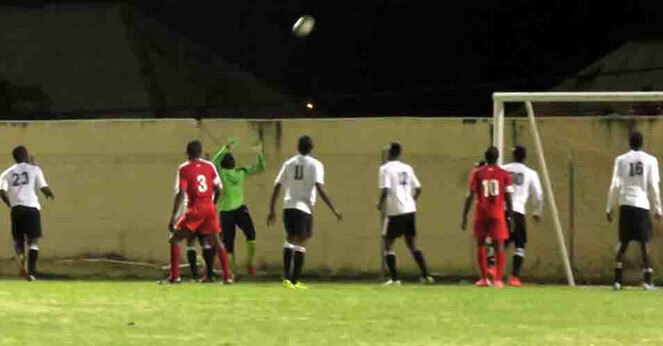 SOL Island Auto Conaree became the first team to make the Finals of 2015/2016 playoffs when they edged Flow 4G Cayon Rockets 2-1 on Wednesday (May 25) at the Warner Park Football Stadium. It was a party atmosphere at the ground in anticipation of an action packed evening of a double header that lived up to its billings, as Conaree took care of business. Playing in the evening’s opening matchup, a 60th minute strike from Marvin Charles was the deciding factor in a high intensity game that saw four yellow cards being shown and one leading to a red card. Conaree’s Errol O’ Loughlin opened the scoring in the 33rd minute, before Charles added to the tally. Javiem Blanchette pulled one back for Cayon, but good defending from the opposition was enough to give the Conaree team their second win in the playoffs. Conaree opened with a 3-2 win over the defending champions on Saturday (May 21st) with Captain O’Loughlin scoring twice in the 23rd and 54th minute and Kadeem Lewis netting in the 45th minute. Jerome Richards (13th minute) and Shaquille Pringle (76th minute) were the goal scorers for St. Pauls. In the other game from Wednesday evening, Winners Circle Newtown United, the team that dominated the Premier League season, was eliminated from the playoffs after St. Pauls edged them 1-nil. Playing under damp conditions, both teams fought hard, but neither could have broken the deadlock until the 90+4 minute of the game Joash Leader slotted home an easy shot to break the hearts of the pro-Newtown fans in the stadium. The defeat was their second in as many games, as they went under to Flow 4G Cayon Rockets in the opening match of the playoff. Jerome Richards scored in the 13th minute, while Shaquille Pringle netted in the 76th minute as the chief destroyers in that match. Action continues tomorrow Saturday (May 28th) with a double header; Cayon taking on St. Pauls and Conaree locking horns with Newtown. Winner of the Cayon-St. Pauls clash will progress to the best of three championship game against Conaree that will be played in the middle of June.